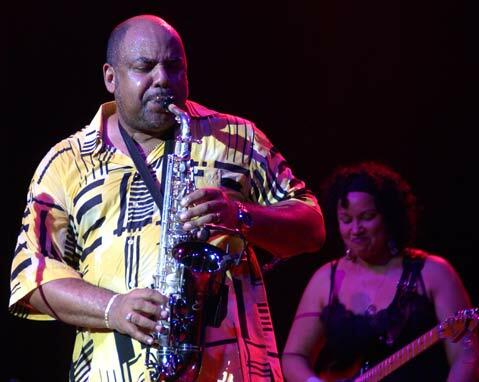 Gerald Albright will be just one of the jazz stars appearing at the Gatsby Jazz Festival this Saturday at the Santa Barbara Polo & Racquet Club. Headlined by jazz artist Brian Culbertson, the first annual Gatsby Jazz Festival comes to the Santa Barbara Polo and Racquet Club on Saturday, August 30, in what promises to be a unique combination of substance and spectacle drawing from the best of several bygone eras. Inspired by the famed F. Scott Fitzgerald novel, Barbecue Club Entertainment founder Mike Patterson has been known to exclaim, “We’re bringing a whole ‘nother element from anyone else,” and he’s not just referring to the distinctive musical lineup of Brian Culbertson, Gerald Albright, the L.A Mambo Combo Latin Jazz Ensemble, Marcus Johnson, and Himalaya. He’s also referring to the Creole-Cajun cuisine, the gaming tables coming from the Chumash Casino, the cigars hand-crafted by Payne-Mason, the fine wines, and more. The audience itself also will become an important part of the visual presentation, as Gatsby-era outfits are encouraged so as to add to the event’s unique ambiance. The event’s dress code recommends white linen attire. Before starting this album, Culbertson got in touch with Maurice White from Earth, Wind & Fire and told him the concept, hoping that his childhood idol might even come by the studio for a day. Instead, White did far more, working as Executive Producer for three months, which Culbertson referred to as a “dream come true.” Together, White and Culbertson created a wish list of guest musicians, and this process led to some great collaborations, including songs featuring Bootsy Collins and Maceo Parker. On the album’s version of Kool and the Gang’s “Hollywood Swinging,” Gerald Albright appears as well, adding a level of excitement to the fact that both Albright and Culbertson will be performing at the Gatsby Jazz Festival. The Gatsby Jazz Festival is at the Santa Barbara Polo and Racquet Club on Saturday, August 30. Gates open at 3 p.m. For information and tickets, visit gatsbyjazzfestival.com or call (877) 805-2582.